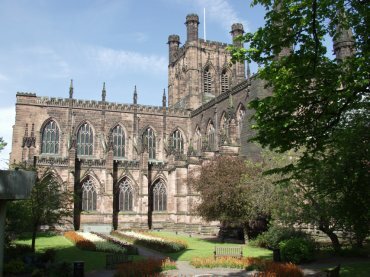 BeenThere-DoneThat: Chester (1), Cheshire, England. 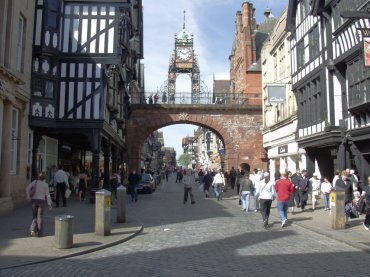 Seen from Foregate Street, outside the city walls, and looking through into Eastgate Street, this was one of the gates into the walled city. The clock, which is supposed to be the second most photographed clock in Britain, is Victorian and only just over 100 years old although it sits above the Medieval gateway. On this visit to Chester we stayed at The Mill Hotel. This red sandstone cathedral is mainly 14th century, although some parts are Norman, and is seen here from the city walls on the eastern side. The main entrance is in St. Werburgh Street on the south-west corner of the cathedral. 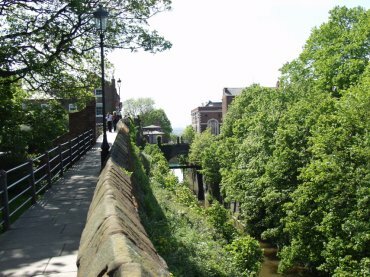 This shows the walkway on top of the city walls with the Shropshire Union Canal far below on the outside of the walls and the Bridge of Sighs arching over the canal in the near distance at Northgate. These walls were initially built by the Romans to completely encircle the city although this canal would not have existed at that time. This bridge was built in 1387 and is wide enough for just one vehicle so that access is now controlled by traffic lights. The outside of the city walls is showing through the trees on the right. This view is from The Groves. 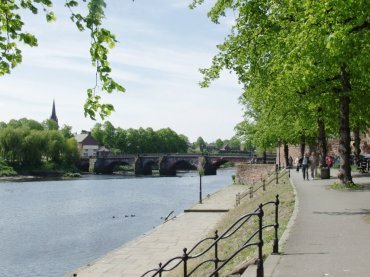 The River Dee rises in Wales and travels 60 miles, passing through Chester, before discharging into the sea near Liverpool. Trips on the river are available from the riverside at The Groves. The Shropshire Union Canal, Chester. This location was a short walk along the tow path from our hotel and shows the Bridge of Sighs at Northgate. There is no way up to Northgate, from the canal towpath at this point, so one must walk a little further to gain access to the city. 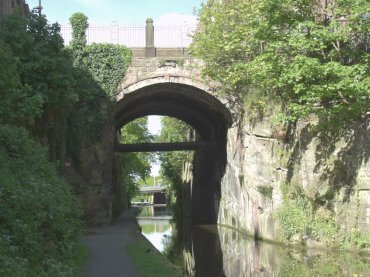 The Shropshire Union Canal runs for 60 miles from Wolverhampton through some of the most sparsely populated areas of England to Ellesmere Port. It passes Chester on it's northern side running parallel with the city wall.